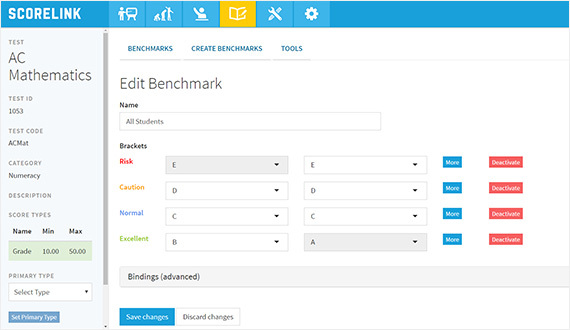 We are constantly developing Scorelink to add new features and reports, and this is directly driven by user feedback and requests – this helps us stay at the cutting edge of what schools actually need and want. Like all good things, Scorelink is much more than the sum of its parts – but if you’d like to see some of its parts then have a read below: we haven’t included every little thing, but we’ve put in some of the key highlights. For a real understanding you need to see Scorelink in action. Collecting data in the classroom can be a tiresome chore, and keeping track of the data can be even worse. 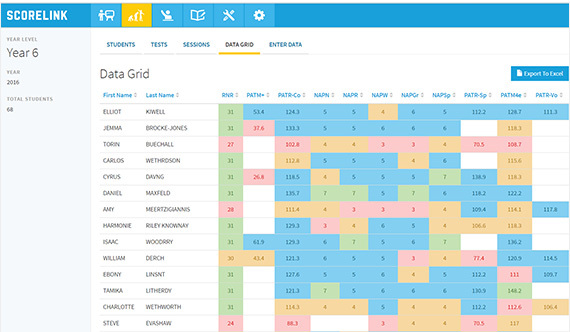 Collect and enter data all at once, or test students as required and enter the data bit-by-bit: the choice is yours, and Scorelink keeps track of who has already been tested. Student test results are often stored in an array of spreadsheets, word documents and physical papers, making them difficult to analyse and manage. 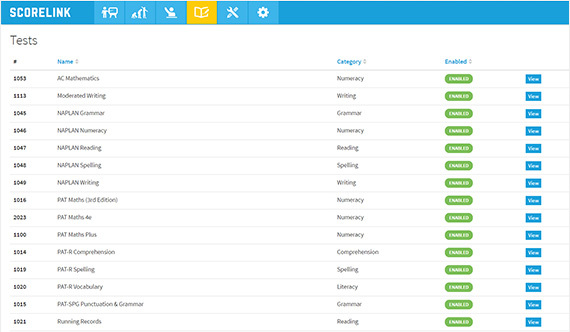 Scorelink is one simple system to store all your student testing data in the same place, allowing you to find results at the touch of a button. Many students need a bit of extra attention: maybe some learning support for the vulnerable, or extension for those travelling well. Either way, keeping track of which students need attention in which learning area can be tricky; across a class, a year level or the whole school becomes impossible. 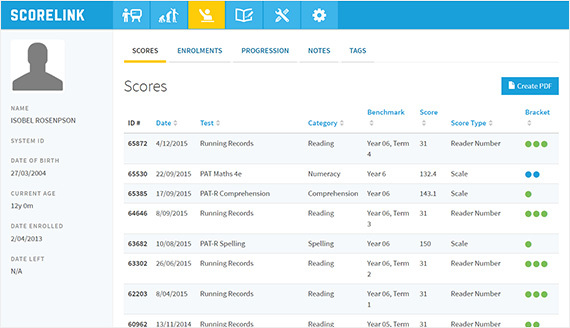 Scorelink uses a simple colour-coding system to easily identify which students need a bit of extra help. Knowing which students are performing above- and below-standard is good, but often the discussion is more about how they are travelling. Scorelink has several growth-analysis tools to help monitor the students who track well between tests, and those who dont. 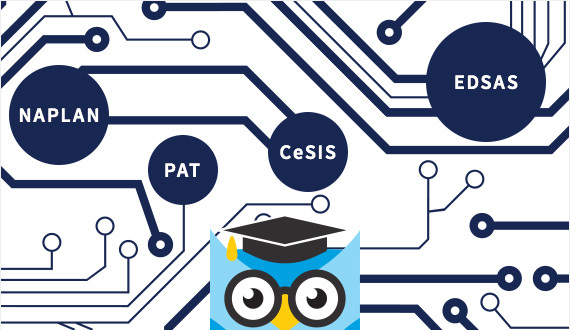 Every school is different, and each site has their own measure of what is considered “at-benchmark”. 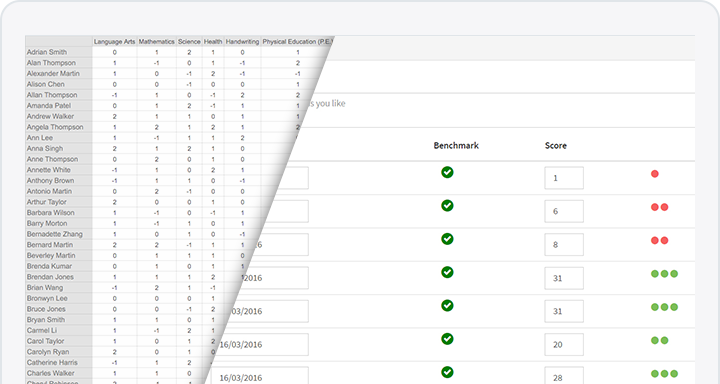 Scorelink allows each school to set colour-coded benchmarks at levels that make sense for them, so that results have real meaning. 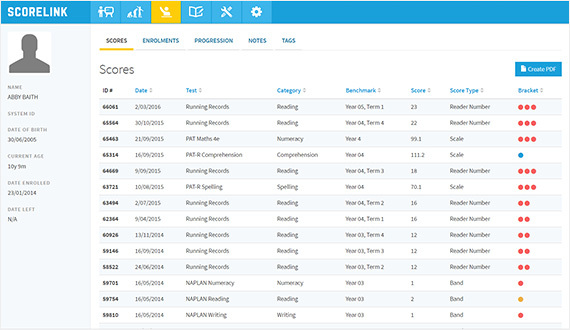 Scorelink has configurations for most popular tests including NAPLAN, PAT, Running Records and over 40 more, and the list is constantly growing. Using a test that isn’t on our list? We are always happy to look over a new test and see if it’s a good candidate to be added. Integration is a big buzzword today, and it refers to different digital systems or formats working together. We’ve created integrations with some of the other popular tools and systems you may use, to make your life a little easier. 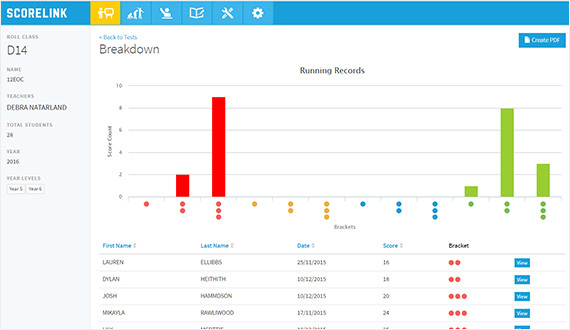 Scorelink looks great to you, but what happens when you need to show some data to a parent, or participate in a planning meeting around intervention strategies? We’ve put together beautifully designed PDFs for all of the common reports so you can view, download and print whatever you need to. Great to slip into a student’s file for later review. Sometimes there is a little bit of extra information that needs to go with a score, or an event in a student’s life that is relevant to their learning. 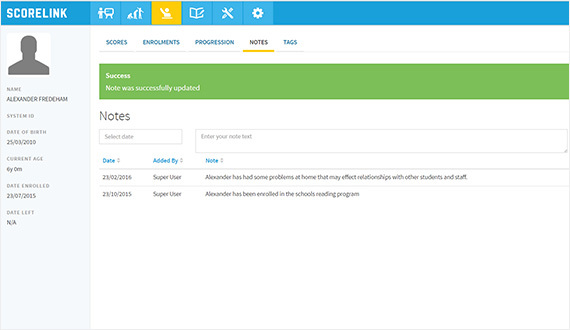 Scorelink allows anecdotal notes to be attached to a student’s profile so that this information can be effectively communicated between users. 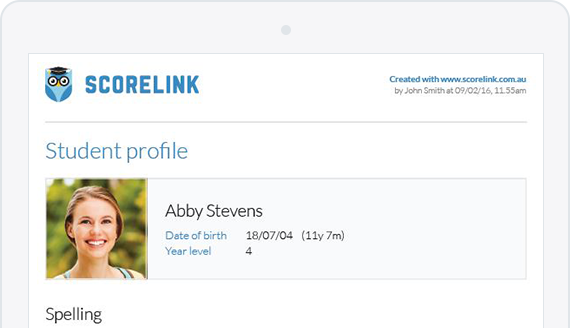 The day-to-day operation of Scorelink has been designed with teachers in mind: mark your classes or specific students as favourites to find them within seconds, and review the data at a glance. 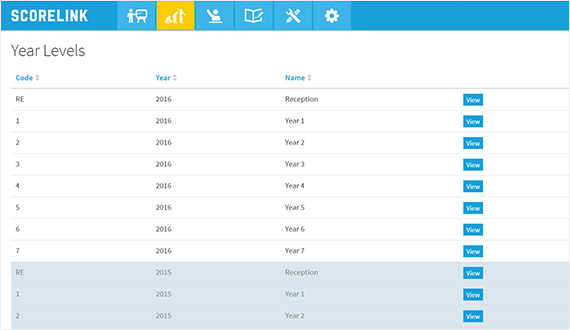 Within 3 clicks of logging in you can be entering data for your class or reviewing a graph of recent results. There is a wealth of data collected each year in schools, but not a lot of tools to help collate and interpret what it’s actually telling us. How much value have we added to a particular year level throughout their time, or in which classes are the greatest concentration of students struggling with literacy? Has an intervention produced positive results? These are all questions Scorelink can help you answer. 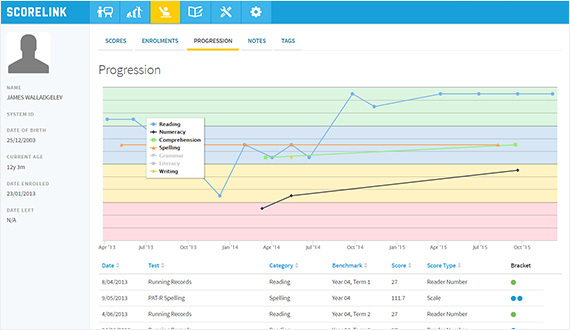 The discussion with parents often centers around their child performance and how that compares to the class or year level – with Scorelink you can produce reports that walk them through that data without mumbo-jumbo jargon, just clear reports showing the facts. Adding yet another system to be managed by your IT team won’t make you popular: unless the system is Scorelink. Once it’s deployed and configured Scorelink will automatically take backups of itself and make these available on the network, ready to be included in a site’s backup strategy. We provide compatibility with most popular virtual backup software systems, and make inviting users and managing permissions a breeze. Best of all, we obtain remote access to your Scorelink server so if anything goes wrong we fix it ourselves, rather than making more work for your techs. © 2019 Scorelink. Web Design by Argon Design.